The end of the calendar year is approaching and with it comes not just the usual holiday hustle and bustle but end of semester exams and less sunlight in a day….all the things that typically add more stress onto a student’s already stressful life. We know that many students are celebrating the holidays by exchanging gifts but we believe that there’s no better gift to give a student than the gift of hello. We know that there are many students – whether they show it outwardly or not, speak about it or not – who suffer from loneliness, stress, anxiety or depression. Yet most choose to keep their suffering silent, which we know leads to the condition worsening, either in the short or the long term. In some cases, left unchecked, these forms of mental illness can lead to students attempting to end their lives because they simply feel alone. What scares us most is that there’s no way to tell who is suffering. The happiest people, those who seem strongest, are often the ones suffering the most. You need look no further than Robin Williams, the world-famous and successful funny man/actor who suffered with depression, or the student who inspired the #YellowIsForHello campaign, Lucas Fiorella. Among his friends Lucas was the “go-to” kid when others needed a laugh, a hug or shoulder to lean on. He didn’t let on that he was suffering – and no one asked. He was no different than any other university student. In fact, he may have had more going for him than most. Yet, that did not stop the disease from taking control of him. This campaign takes a cue from Lucas’s life. Despite his suffering, Lucas made the effort to reach out to friends, acquaintances, and often strangers among his peer group with a “hello” when he thought they needed someone to talk to. In a number of cases, those he reached out to were suffering alone or in silence and that one hello led to a conversation that saved a life. Gift the gift of hello and you may very well start a conversation that saves a life. So between November 24th, 2015 and December 25th, 2015 we’re asking students across Canada to reach out to friends every day, those that they see often and acquaintances that they may not connect with as often … and say “hello”; ask how they’re doing – how they’re really doing. Give the gift of hello and you may very well start a conversation that saves a life. At a minimum, you’ll make someone’s day! 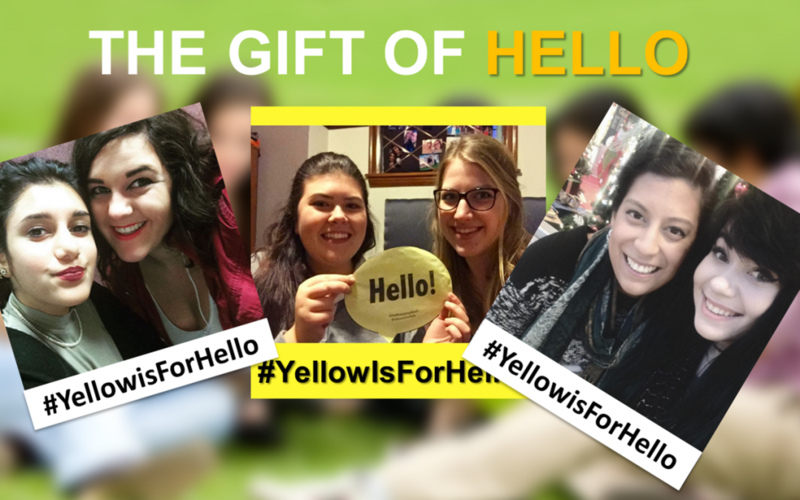 While you’re at it, take a selfie and share it on Instagram or Twitter with the hashtag #YellowIsForHello and a caption of your choice. Share your gift and encourage others to do the same! You don’t need to be a student to join the campaign! We encourage all of you – young and old – to join the campaign and give the gift of hello. One student at a time, one hello at a time, we can all do our part to enrich the lives of our friends. In the end, it might be your own life that you save. Visit the campaign page here. Thinking about suicide? Call 911 immediately. Need to talk? Please visit our Canadian resources page.